But the plans to build offices for thousands of workers have run into local opposition. SEVERAL OF GALWAY’S leading business figures have weighed in behind plans to build a landmark €100 million development in the city’s docks. But the project faces both local opposition and objections from the nation’s primary conservation body. Well-known developer Gerry Barrett recently applied for planning permission to build four large office blocks, as well as 2,000 sq m of retail space and restaurants, overlooking Galway bay. The scheme, estimated to be worth €100 million, would create office space for 2,600 workers when completed. It is hoped that it would prove attractive for multinational companies considering setting up shop in the west of Ireland. The project, dubbed ‘Bonham Docks’, is being built adjacent to land owned by public transport group CIE which is also expected to be sold in the coming years. Barrett saw the control of many of his businesses transferred to Nama during the financial crisis. He exited the state bad bank in 2014 and managed to hang onto the Bonham Docks site, which was once an oil storage depot for Topaz. Recently filed documents show that several parties have objected to the ambitious scheme, most notably An Taisce. In a submission to Galway City Council, seen by Fora, the Galway arm of the conservation group said that it is “fully supportive of appropriate and sustainable strategies for future development in the key regeneration areas of the inner harbour”. However, it said that the scheme contradicts the latest Galway city development plan, which has a clause stating that projects in the inner harbour area should be made up of 30% residential development. It also said that a comprehensive plan should be drawn up for the inner harbour before a project on the scale of Bonham Docks is considered. An Taisce called for the development to be either rejected, or for revised designs to be put forward. One of Barrett’s companies has separately applied to build 345 beds of student accommodation in the area, which would ostensibly be the residential part of the project. However, An Taisce said that this does not properly fulfil the criteria. “Residential use within the city centre, especially in a key proposed regeneration area, must conform to environmental, housing and community beneficial values and in the creation of sustainable neighbourhoods,” it said. The group was one of several parties that objected to the proposal. Most of the others against it were local residents, who said that the proposed six- and seven-storey office blocks are too large. “The 36m height of the buildings is excessive and is not in keeping with the look or feel of the city,” one said. CIE also made a submission raising some issues with the project. While it said it was broadly in favour of the scheme, it highlighted how close the development is to its own site. “This is inappropriate and effectively prevents any commercial development on CIE’s property,” it said. However several prominent local business figures put their support behind the project. John Breslin, the co-founder of Adverts.ie and Boards.ie, and the chairman of Startup Galway, said in a submission that the Bonham Docks project would regenerate an unused site and drive employment in the region. Altocloud CEO Barry O’Sullivan, a long-standing fixture on RTÉ’s Dragons’ Den, said in a submission that his firm wants to grow from its current headcount of 25 to eventually employing hundreds of people. “Our employee demographic does not want to be in an industrial park at the edge of the town. City-centre living and working is the lifestyle they expect,” he said. Paul Mee, a tax partner with Mazars, said that the development will provide “the much-needed stimulus for a significant amount of job creation in the IT, high tech and financial services sectors”. Galway City Council is due to make a final decision on the project by the end of the month. Email “'Galway needs this': Business heavyweights back a €100m docks development”. 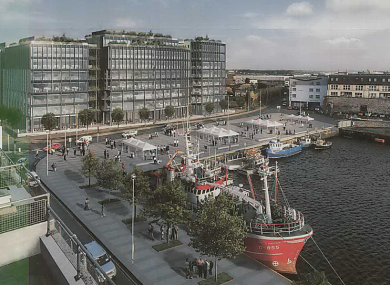 Feedback on “'Galway needs this': Business heavyweights back a €100m docks development”.